I work at trying to convince my wife of the benefits of being married to a CD. She had one occasion over the years to borrow a pair of my pantyhose. I have been the beneficiary of some of her makeup that didn't work...most recently a mascara in a shade of dark blue. I do think that she has learned to appreciate having me as both a husband and as an occisional girlfriend. Simply gorgeous! The dress looks great on you, and the earrings add a bit of an edge. Thank you! 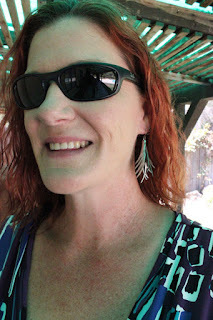 I also like the earrings and agree that they do add an edge to the outfit. Love the earrings! I will respond fully to this message in an upcoming post. Thanks for taking the time to write.